This giveaway has ended and the winner, Jamie P, has been notified. Keep checking back for more great giveaways! It’s time for another fun giveaway from UPrinting.com. Just in time for the holidays, UPrinting is giving away 50 Custom Thank You cards and envelopes! These cards are perfect for thanking friends and family for all those holiday gifts or even giving away in a gift basket! Don’t need Thank You cards? Customize it and turn it into a greeting card instead. 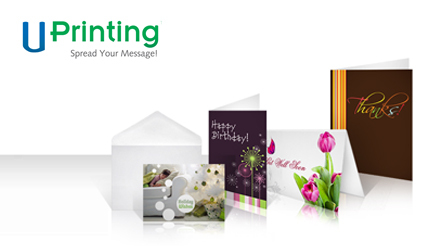 UPrinting cards are printed on high-quality paper and cardstock and are perfect for just about any occasion. Enter to win the 50 Custom Thank You cards by leaving a comment below telling me how you plan to use them! Be sure to leave a valid e-mail address with your comment so you can be notified if you win. This contest will close on November 29, 2009 at 12:00 Noon (Central). A winner will be chosen from all valid entries by Random.org and notified by e-mail. The winner will receive an e-mail directly from UPrinting with a code for their 50 free cards on December 5, 2009. Disclosure: In appreciation for hosting this giveaway, UPrinting is also giving me a set of 50 Custom Thank You cards with envelopes.